Fantasy, science fiction, and role playing games with an Asian twist. While I do enjoy fantasy art a lot, there is one element that often makes me go "oooog." Swords. There's a good reason the designs we see through history are the way they are, so when I see something that's totally impractical, or that could be even more dangerous to the wielder than to the enemy, it detracts a lot from the total impact of the art for me. Which is too bad, because quite a few illustrations featuring such overly fanciful blades are otherwise nicely done. 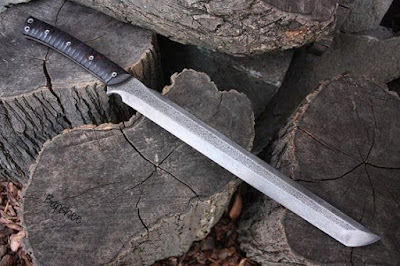 Why am I ranting on fantasy swords? 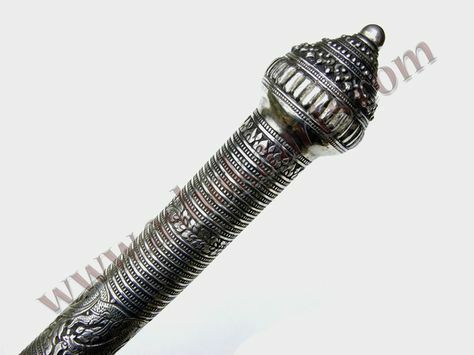 Because I'm searching for visual pegs for Swords of Maruzar, and decided to look at fantasy/scifi weapon designs as well as historical ones. I believe that weapons should be practical, and at the same time convey a distinct cultural identity -- and with the added requirement that the look convey some sense of alienness. I enjoyed Michael Whelan's Renaissance-style rapiers for Barsoom, but that's not the direction I want for Maruzar. I want a greater sense of separation from historical Earth, and from ERB's Mars. 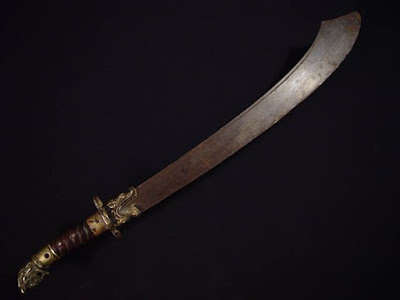 Nor do I like the sword styles of Disney's John Carter -- I find it way cool that they're based on Philippine kampilans, make no mistake, but the hilt designs felt crude for the otherwise elevated culture of Barsoom, nor do they jive with ERB's descriptions of Barsoomian swordplay. First, I'm thinking that over the centuries of battling the armored alien insects of the Swarm, Maruzarian weapons would have been adapted to breaking through hard, tough chitin. I think this would favor swords with heavier blades, falchion types with mass concentrated at the point of percussion. There's a limit to how much widening at the point would be useful, though, as the heavier the tip, the worse the inertia of the blade. On the other hand, estoc-like piercing blades might also be useful. 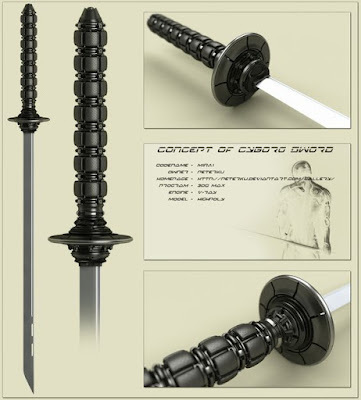 I'm not so inclined to those, though, as they'd look too close to Whelan-Barsoom rapiers. Second, I like clean lines. 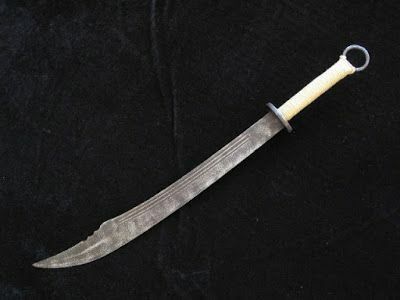 There's a good reason historical weapons have clean lines -- notches and grooves and certain odd shapes weaken the blade, and since Maruzar's fallen back on simpler technologies, they wouldn't have the advanced metallurgy to counteract such weaknesses. Third, I'm looking for visual cues that will make Maruzarian weapons look unique to Maruzar. This is the hardest one -- my first two criteria eliminate a lot of possibilities. No insanely impractical blade shapes. No stupid jags and notches just because they look cool. No overly fancy blade, guard or hilt designs, because that doesn't match the post-apocalyptic tech levels of Maruzar. 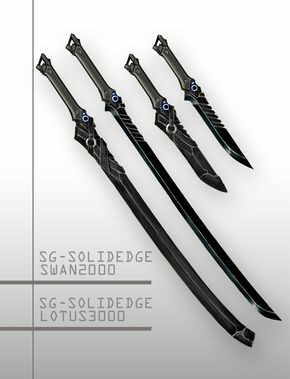 Right now, all these have me leaning toward designs inspired by the variety of Chinese dao swords. Most soldiers will have variants based on the broad, heavy guitoudao and huyadao -- heavy duty cutters and choppers suited for use with relatively little training. Maybe noncoms and champions would carry versions of the very heavy dadao. 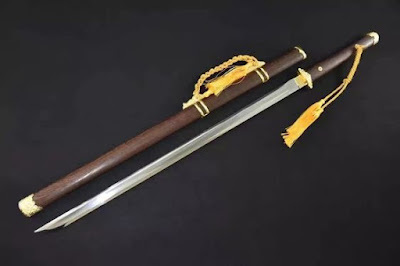 Officers could carry slimmer swords that take advantage of their higher degrees of training, and nobles could have swords like the slim, two-handed Tang dao -- which is the ancestor of the Japanese tachi and katana. Maybe superior metallurgy gives these nobles' slim swords the same cutting power as the broader, heavier soldiers' swords (they could be blades left from Maruzar's high-tech past). Other historical swords that look right for me are machetes and parangs, and the modern designs inspired by them. 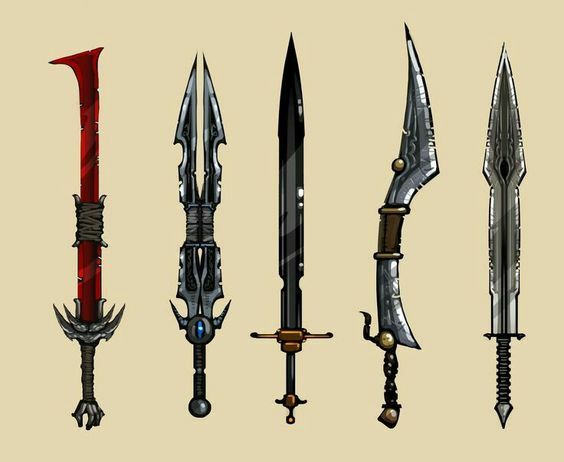 These swords would all have simple round or oval guards, and similarly simple round or polygonal pommels. I've noticed that Chinese pommels are usually round or ring-shaped, so maybe angular polygons could give me the look I want. Besides, it's kinda appropriate for a player character's sword to have an icosahedral pommel, heh heh. Cool setting, Tim! I'm starting to read your Sundaland posts just now. 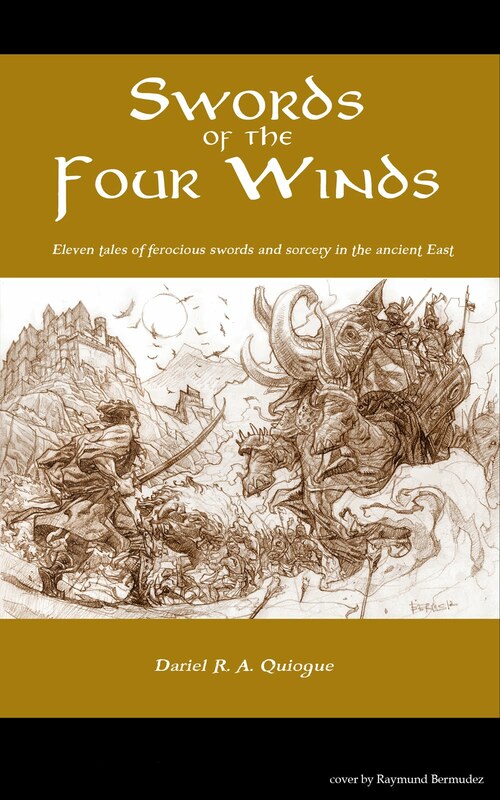 Eleven tales of swords and sorcery set in the ancient East! Get it now! Swords. Sorcery. Dinosaurs. Aliens. 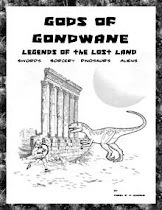 Get it at RPGnow!